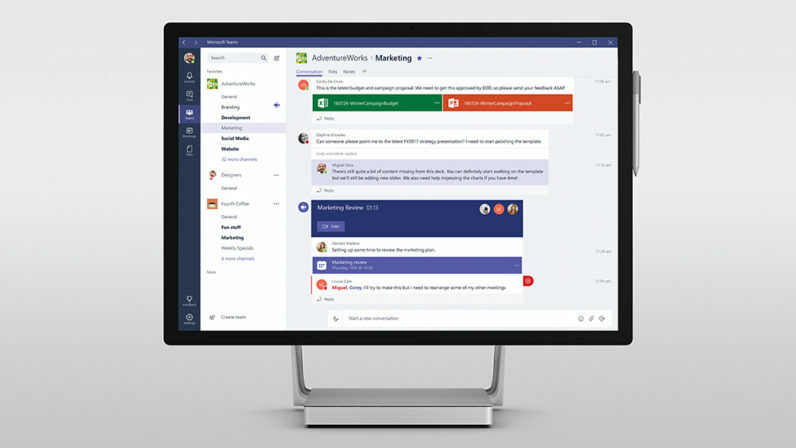 Following up on its announcement last week, Microsoft has started to roll out Teams, it Slack competitor, to Office 365 users globally. The service was announced late 2016 as a take on the workplace chat app with powerful Office integration and threaded messaging (something Slack didn’t yet have, on the time). For more on the basics of Teams, check out our original post here. Today’s roll out comes along with a few new features, such as audio calls from mobile devices and video calling on Android (iOS and Windows Phone are coming soon). You can also now email an entire channel, send messages using markdown formatting, and receive notifications about all posts in a channel. On that note, Microsoft’s released a video on some of the new features available since the announcement, so you can check out the whole thing below if you’re interested in trying out the software. Slack has dominated the field for some time now, and has the advantage of being somewhat platform agnostic; it’s not tied to Office, Google Docs, or any other service. But Microsoft says it doesn’t want Teams to be perceived as a solution just for heavy Office users, and is open to integrating as many services as possible. That being said, Microsoft had some momentum with Teams, saying it’s seen “more than 50,000 organizations” start to use it since the preview became available. It’ll be interesting to see if it manages to keep that up now that it’s widely available, especially given Google has just entered the fray too.